The 2014-15 Denver Nuggets basketball schedule kicks off on Wednesday, October 29th, 2014 at home against the Detroit Pistons. The Nuggets hit the road a few days later for their first away game to take on Kevin Durant and the Oklahoma City Thunder on November 1st, 2014. The Nuggets have Christmas Day off this season but turn around on Boxing Day to take on the Minnesota Timberwolves. Denver wraps up regular season play on April 15th, 2014 on the road against the Golden State Warriors. 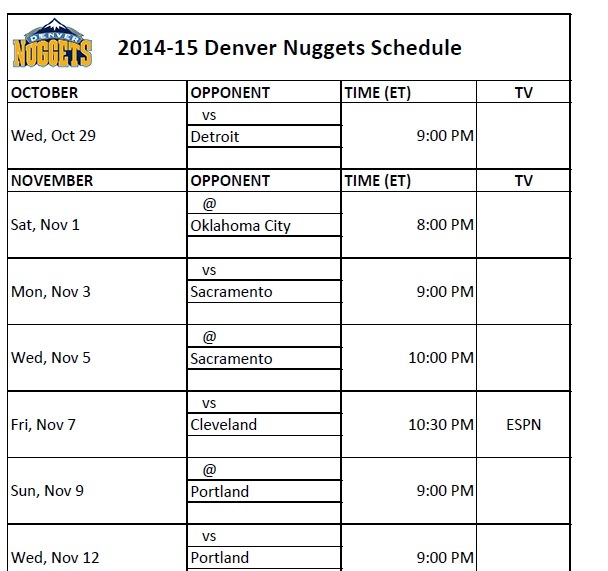 The following printable 2014-15 Denver Nuggets schedule is provided for those who would like to print out the team’s schedule for the 2014-15 NBA regular basketball season.